Get affordable Security Camera Installation on Manhattan Beach, CA and CCTV equipment with commercial quality and 2 years warranty. When you are in the market for security camera CCTV vendors will provide product specification of their cameras, but how do you know what to look for in the specifications? , which specifications are important? They can include such things as resolution, minimum light sensitivity, lens, WDR and IR range. If you first option is to get a DIY security camera system it would be wise to do some research about this. Another option is to hire a CCTV to provide you the right security camera and installation. 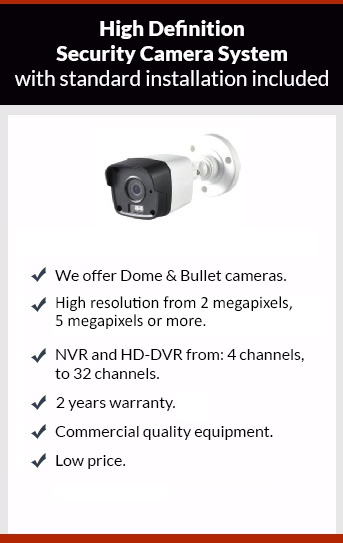 Protection4less has a lot of experience on CCTV projects, and can offer you the best equipment and installation for your business or home at a low price. Give us a call the estimate is free.